Surprise! You need to measure dry ingredients differently than you measure liquid ingredients for cookie recipes. Measuring cups and spoons for dry ingredients are different than liquid measuring cups –for good reason. Dry ingredients have stationery properties. When scooped or poured or transferred, dry ingredients settle right away. Liquids, however, reshape and reform. Their fluidity requires time to settle. Dry measures are available in sets of graduated, nested cups and spoons. They have straight sides with a handle and are available in heavy plastic or metal. Measuring cups are made in ¼ cup, 1/3 cup, ½ cup, 1 cup, and 2 cup sizes. Measuring spoons come in sets with 1/8 teaspoon, ¼ teaspoon, ½ teaspoon, 1 teaspoon, and 1 tablespoon measures. Do the math. A recipe may call for an amount that aligns perfectly with cup or spoon measurements. In other instances, you may need to combine two measures together to arrive at the required amount. For instance, if your recipe calls for ¾ cup of flour, you will need to measure both a ½ cup of flour and ¼ cup of flour in order to follow the recipe accurately. Cover the surface. Set out a plate or piece of waxed paper on your work surface. Fill cups or spoons. Place the measuring cup or spoon over the work surface. Fill it so that the ingredients round over the rim. Do not shake or pack the ingredients into the cup or spoon. Rather, fill the cup to overflowing and then use a flat utensil to level it off. Level ingredients. Use the back of a knife or other flat-edged utensil to level off ingredients and give you an accurate measure. Spoon the flour or scoop the flour? It’s a bit of a conundrum among bakers. Who knew that to measure dry ingredients would be so controversial? 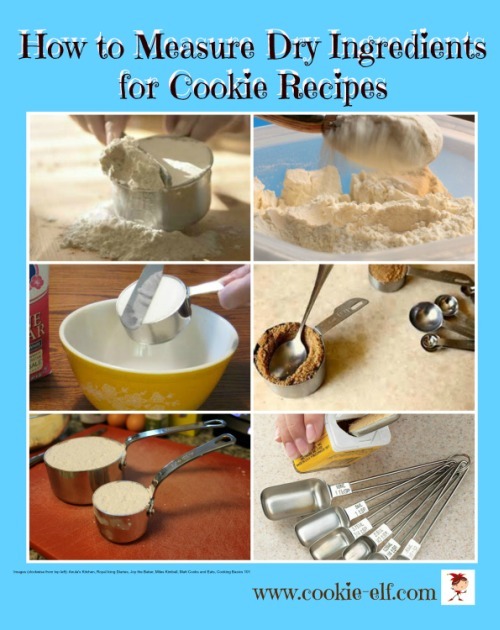 Some point out the difference between spooning flour into the measuring cup and scooping the flour into the cup when filling it can mean different amounts of a few tablespoons or even a ¼ cup in your cookie recipe. Here's what each of them mean. To spoon: use a spoon or utensil to transfer flour into the cup until it overflows, and then sweep the excess off with a knife. To scoop: aerate the flour first by stirring it with a knife or whisk. Then use the measuring cup itself to scoop the flour directly into the cup before leveling off the excess. Which method should you use? Follow the recipe. If the recipe doesn’t specify, then The Elf recommends a combination approach: fluff the flour, then spoon it into the measuring cup with another utensil before leveling it off. Should you sift flour when making cookies? Sifting and fluffing aerates the flour. So consider your flour. Is it settled or aerated? If you haven’t baked in awhile and your flour has been stored in your pantry for several weeks or months, then it has likely settled. On the other hand, even if you bought the flour awhile back but just poured it from the bag into a canister, then it has just been aerated. Or if you baked a different batch of cookies yesterday and whisked the flour with a wooden spoon, then it is more aerated than not. As always, follow your recipe. If it specially tells you to sift the flour as you measure dry ingredients, then do so. But if the recipe doesn’t specify, then fluff the flour by stirring it with a wooden spoon or whisk before measuring it. Although they perform different functions in a recipe, baking powder and baking soda can be measured in the same way. Stir or fluff the ingredient. Use the measuring spoon to lightly scoop it out of the container. With a knife, level off the excess. Granulated sugar. Scoop sugar directly out of the storage container or bag until the measuring cup overflows. Level off the top by sliding a knife over the rim of the cup or spoon. Brown sugar. Brown sugar is moister and denser than granulated sugar, thanks to its added molasses. Most recipes that all for brown sugar specify that it is to be “packed.” To do so, use the cup to scoop the sugar out of the container, then press or pat it down with your fingers to fill and mound the cup. Use a knife or straight edge to level off the excess at the rim. Packed brown sugar will retain the shape of the measuring cup when it is added to other ingredients. Powdered sugar. If powdered sugar is clumped, sift it before measuring. Otherwise, spoon the sugar into the measuring cup until it mounds over the rim. Use a knife or straight edge to level off sugar at the cup rim. Choose the correct spoon based on recipe directions. If the spice jar has a large enough opening, insert the spoon, scoop out the spice, and level off the excess using a knife or straight edge. If the spoon doesn’t fit into the container opening, then pour an appropriate amount into a small bowl, scoop up the needed amount with the designated spoon, and level off the excess. Separate rings. Dry measuring cups and measuring spoons often come on rings. Remove the rings so the cups and spoons are easier to use. Stack or nest them for storage. Go double. Keep two sets of dry measuring cups and measuring spoons. They are inexpensive. This way you needn’t wash off cups to measure dry ingredients of different kinds, but you can use both sets simultaneously.